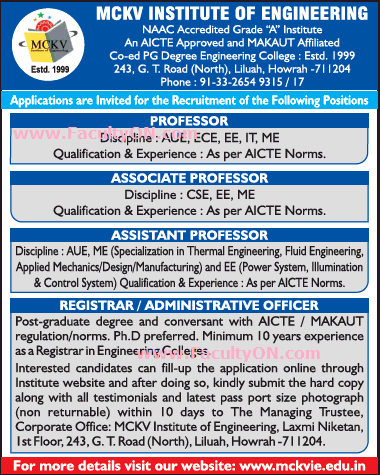 MCKV Institute of Engineering, Howrah has advertised in THE TIMES OF INDIA newspaper for recruitment of Teaching Faculty- Professor / Associate Professor / Assistant Professor Plus Non-Faculty jobs vacancies. Interested and eligible job aspirants are requested to apply within 10 days from 30th May 2018. Check out further more details below. About College: MCKV Institute of Engineering (MCKVIE) is an engineering college founded in 1999, affiliated to West Bengal University of Technology. It ranks as one of the top engineering colleges in West Bengal and graded AA+ by Careers 360 (magazine) in 2015. How to Apply: Interested and eligible candidates are requested to apply online first and then send CV with all copies of certificates / testimonials and recent PP size photos to the postal address mentioned below.